A Construction company is looking for a Delivery Driver with a code 10(C1) license The Candidate must have clear driving record and a minimum 2 years driving experience. Duties ... will include daily deliveries, collections and other ad-hoc driving duties basic Salary R 8,500 per month plus company benefits. Companies presently offering Driving job vacancies in Cape Town City Centre include Woolworths, Mail and Guardian, Media24.. 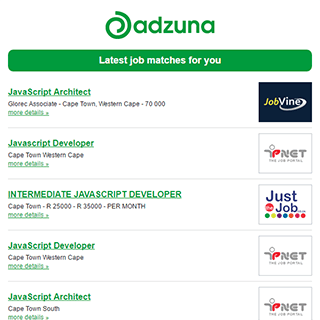 The Adzuna recency index score for this search is 1.29, suggesting that demand for Driving job vacancies in Cape Town City Centre is increasing. The standard deviation of salaries for the results of this search is 389,795. The largest category under which open Driving jobs are listed is Other/General Jobs, followed by IT Jobs. Get the latest Driving Jobs in Cape Town City Centre delivered straight to your inbox!